If any accessories are missing or broken contact ATN’s Customer Service. The BinoX-HD will operate on three CR123 type batteries. We highly recommend using lithium CR123 batteries. They will provide much longer battery life. 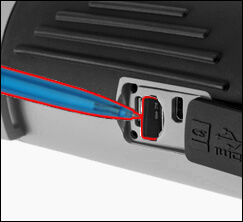 The device is equipped with microSD, Micro USB and Micro HDMI ports.You can find them under the rubber cover near the battery block (we marked the cover with appropriate icons). To open the cover you should gently lift the rubber cover and move it out of the way. Make sure that the device is turned off before inserting the microSD card into the slot. A new card should be formatted before usage. 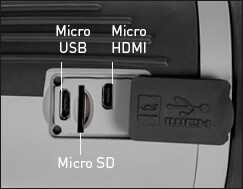 Insert microSD card as shown. To lock the card in the slot push it in with a thin object (a small coin, paper clip, toothpick, etc.). There is only one correct direction to insert the MicroSD Card. Do not force the card into the slot as it may damage both the device and the card itself. 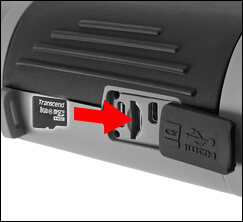 To remove the microSD Card from the slot, push it in using the same thin object. When it pops up a few millimeters, it can be pulled with your fingers or tweezers. If you are going to record video we recommend using a Class 10 microSD Card (10 MB/sec) or faster and have capacity from 4 to 64 GB. Before operating your device please update the firmware to the latest version. To receive a notification of new firmware updates, please register your device on our website (you’ll receive an email letting you know when new firmware becomes available). To update the new firmware you will need a MicroSD Card and batteries that are fully charged. In the event of a power failure during an update the device may crash corrupting its system files and will need to be sent back to the ATN factory for service. It is important not to use additional sources of power during firmware update! Download the ***.bin file from https://www.atncorp.com/firmware (You may need to create an account, if you didn’t create it earlier) and copy to your microSD Card — root directory. Insert the card into the device. In the “Firmware Update” dialog box select “Yes” to start the update. When the update counter reaches “100%” the device will automatically restart. Once the device is powered up it will enter self configuration mode. If the device does not restart within 30 seconds, remove and re-insert the batteries and power-up the device. Once the device has been updated you will need to either format the card or delete the update file manually. In the event you do not, the system will ask you if you wish to update the device every time you turn it on. To TURN ON the device press and hold the POWER button until you see the ATN splash screen. To TURN OFF the device press and hold the POWER button, until the dialog box “Shut down the device?” appears. Choose “Yes” to turn off. 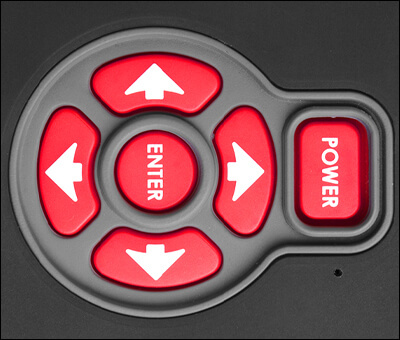 Press and Hold – designed to be used on the following situations — ON/OFF, ZOOM, SHORTCUT MENU. 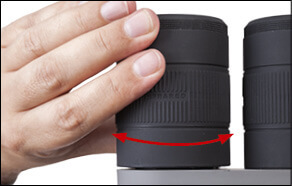 By rotating the Diopter Adjustment Ring you will achieve optimal sharpness for your vision. 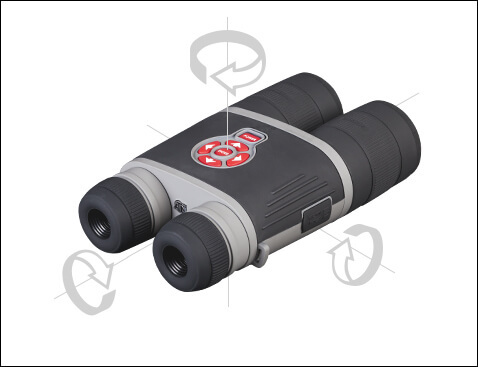 Look through the eyepiece while focusing on the interface on the screen. Do not take the rubber cap off the objective lens. 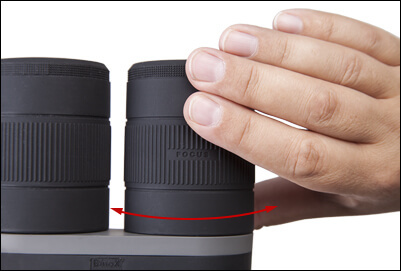 You should not need to re-adjust the Diopter Adjustment unless another user with different vision than yourself will be using the device. Depending on the distance between your eyes, you may adjust the individual eyepieces by moving each one horizontally. In Night Mode your IR Illuminator is critical to providing you extended range and “Total Darkness Capability” by projecting a beam of IR light that is only seen by a night vision device. 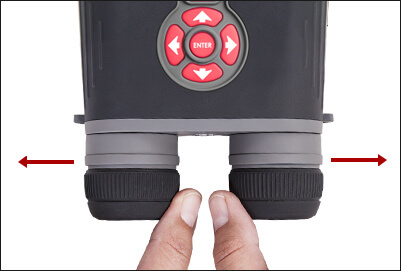 The IR Illuminator will automatically turn ON when Night Mode is activated (although it may be turned off in the settings if you so choose). 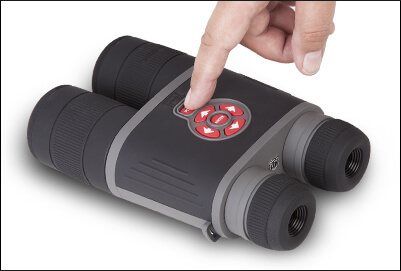 The IR Illuminator beam may be focused by turning the left objective lens. 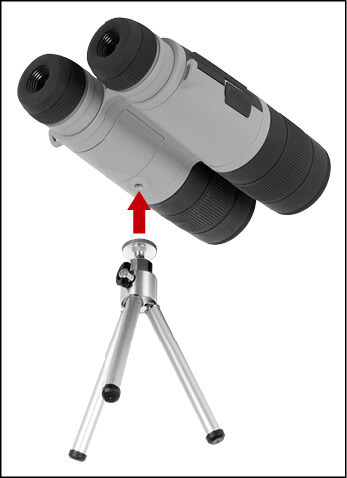 This allows you to tighten the beam for longer range or widen the beam for maximum field of view. 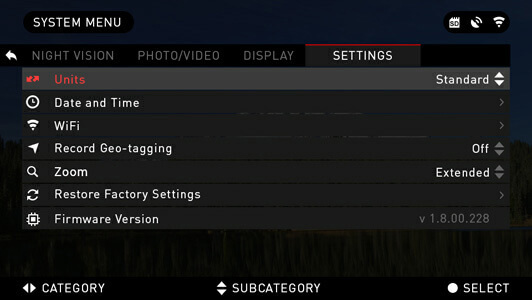 There are a number of settings effecting the function of your IR in the Settings Menu. The BinoX-HD is tripod mountable and can be mounted on tripods with a 1/4” thread mount. When the compass needs to be calibrated the word “CAL” appears instead of the Compass Scale. 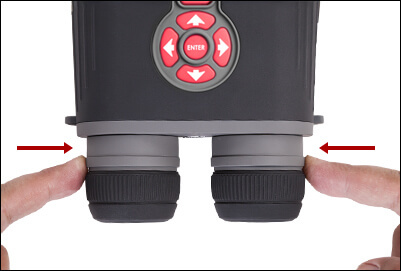 To calibrate you should rotate the device on three axis as illustrated. After calibrating the device please remember that the compass will work best when holding the X-Sight parallel to the ground. UPD — your firmware needs to be updated. First screen you’ll see after switching on the device is Homescreen. It consists of Scales, Status Bar icons and different Informational Widgets. E-Compass Scale shows yaw angle based on e-Magnetometer data. Roll Scale shows binocular cant based on internal 3D Gyroscope. 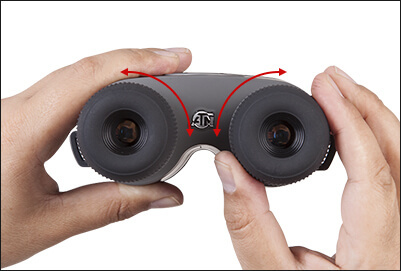 Pitch Scale shows binocular inclination based on internal 3D Gyroscope. Its job is to display information about the current state of the system. GPS and WiFi — show when the function is enabled. Photo Preview (appears in the bottom of the homescreen, after the photo is taken). Display widgets can be disabled from the System Menu. To get to the System Menu you should click on the CENTER button from Homescreen and access the Shortcut Carousel. 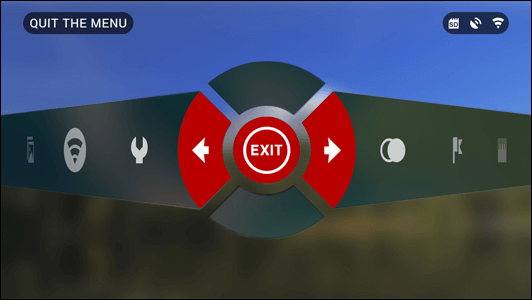 Then select the wrench icon with RIGHT or LEFT buttons and push CENTER button to enter the menu. Select Display tab with RIGHT button and choose subcategory Display Widgets with DOWN button . By pressing and holding the UP or DOWN button on the keypad you will be able to Zoom IN and OUT. Current Zoom Level is displayed in the Zoom widget on the Homescreen. Press the LEFT button to TAKE A PHOTO. Depending on the selected mode, you will make one or several photos. You can choose from various photo modes in the System Menu. By pressing the RIGHT button you will be able to RECORD VIDEO. Your recording will automatically stop when the memory card is full or the battery is out of power. The CENTER button opens the menu and closes it down when pressed again. The Carousel is your access to a number of Shortcuts that allows you quick access to additional features. Just click on the CENTER button from Homescreen to access the Carousel. Buttons highlighted in Red are the only ones that activate a particular shortcut. Movement between the items is carried out using the LEFT & RIGHT buttons ,except the group of ON/OFF switches (WiFi, GPS, Bluetooth). You should use the UP & DOWN buttons to switch modes. To turn ON or OFF a particular switch you should click the CENTER button while having the switch selected. Example — WiFi. Switch between Day and Night Mode. 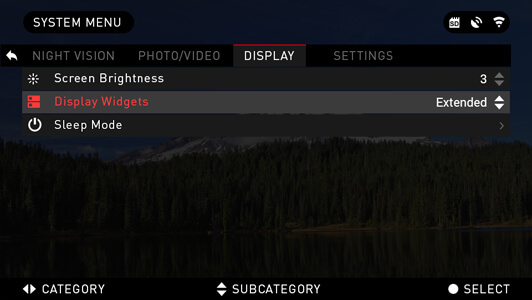 Options such as color palette and other settings for Night Mode can be changed in the System Menu. Gives you access to the library of Images and Videos that are stored on your unit’s SD Card. Allows for access to various system options and adjustments. 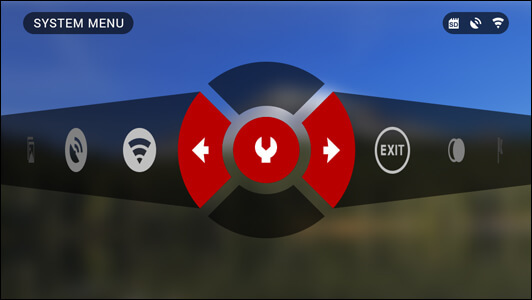 To enter the System Menu you should open Shortcut Carousel with CENTER button and select the wrench icon with RIGHT or LEFT buttons . 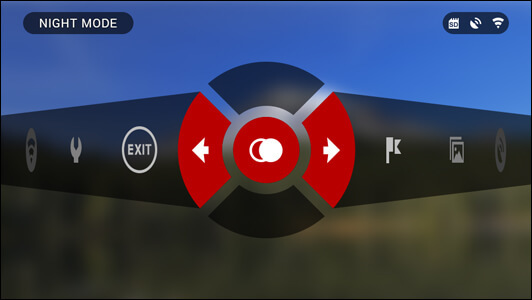 Then push CENTER button to enter the menu. The System Menu consists of a Tab Bar at the top of the screen, list of subcategories in the center and Help Information at the bottom. On the left side of the Tab Bar you will find the Exit (with arrow icon). Pressing it with CENTER button will bring you back to the Homescreen. Movement between the tabs is carried out using the LEFT and RIGHT buttons . Each tab includes subcategories. To select a particular subcategory you should use the UP and DOWN buttons and press CENTER button . To change a particular value you should follow the next few steps. Select the subcategory you need with the UP or DOWN buttons . Press the Center button to select a particular value (once selected it will turn red). Change the value with the UP and DOWN buttons . To select a new value press CENTER button to confirm the change. To switch between Day and Night Mode you should choose NIGHT MODE in Shortcuts. Shortcuts allows you quick access to the Carousel that contains quick access to your units features. Just click on the CENTER button to access the Carousel. Remember that turning on Night Mode during daylight will not harm your device, however you may not be able to see anything due to the image being too bright. 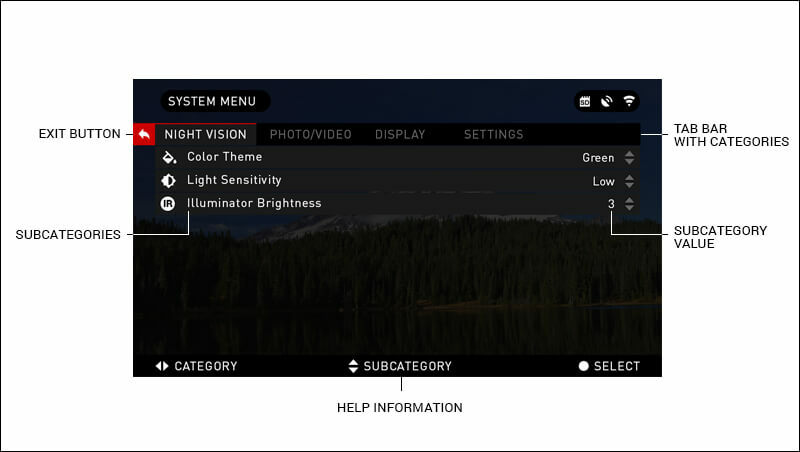 You can choose preferred Сolor Theme or adjust the Light Sensitivity in the System Menu (Night Vision section). Then Press the CENTER button to select a particular value (once selected it will turn red). 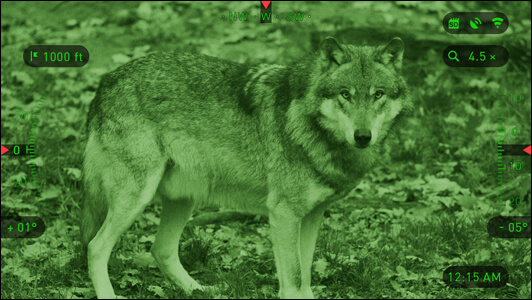 And choose Green or Black&White mode, confirm it by pressing CENTER button . 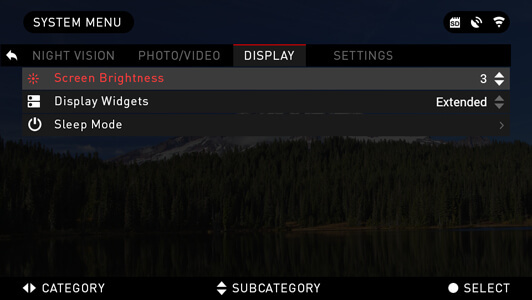 Night Vision category will be available from the Shortcut Menu. Light Sensitivity does not change when changing color modes. If you press the LEFT button while staying on the Homescreen to TAKE A PHOTO. You must have a microSD card inserted in the device for these features to work. All files will be stored on the microSD card. Depending on the selected mode you will make one or several photos. 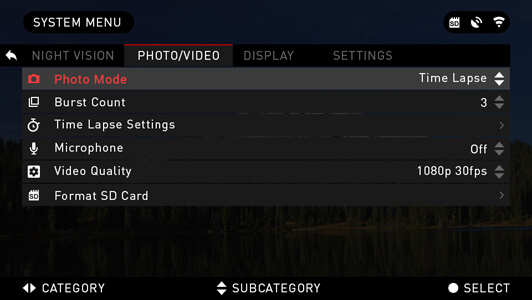 You can choose from various photo modes in the System Menu. There are three photo modes to choose from. 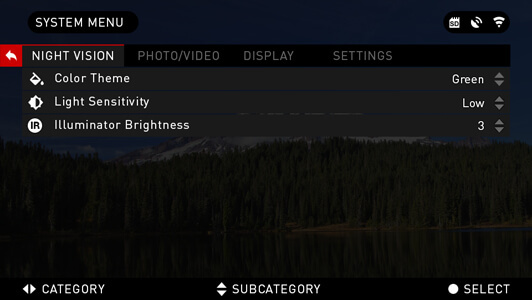 Switching between modes is done in the System Menu in the Photo/Video tab, subcategory Photo Mode. Use UP or DOWN buttons to switch between modes. Press the Center button to select a particular value (once selected it will turn red). This default mode allows you to take one photo at a time. Time Lapse is where the device takes a sequence of images of a subject with an interval of time between each image. The interval and the number of photos taken can be changed in the System Menu. 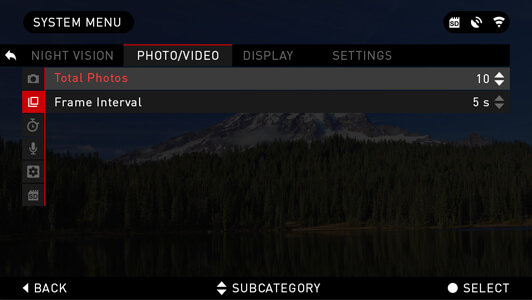 To make changes choose Photo/Video Tab in System Menu, then use UP or DOWN buttons to select Time Lapse Settings. Press the CENTER button to enter the mode settings. 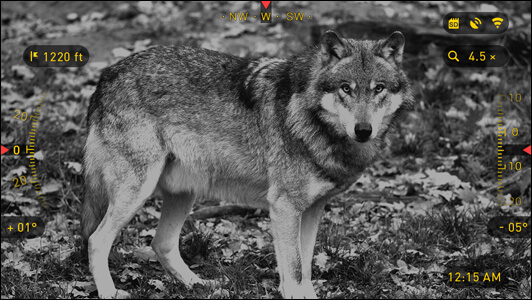 While you are in this mode, the Time Lapse widget appears. Burst mode captures a series of photos. You can select the best image of the group or arrange them in a sequence to study the transitions in detail. 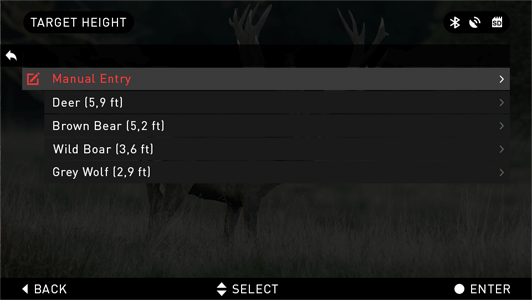 The number of the photos taken can be changed in the System Menu. While you are in this mode, the Burst widget appears. Regardless of which mode you are using the preview appears after a photograph is taken on the bottom of the screen for several seconds. If you press the RIGHT button to Start Video recording. Press RIGHT button again to stop Video recording. 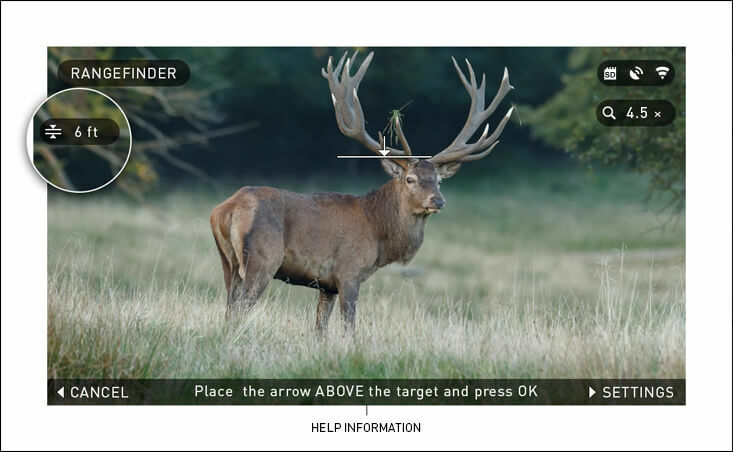 Using the Smart Range Finder you will quickly be able to estimate the distance to your target as long as you have reasonable knowledge of the size of your target. To use select the Flag Icon from the Shortcut Carousel. 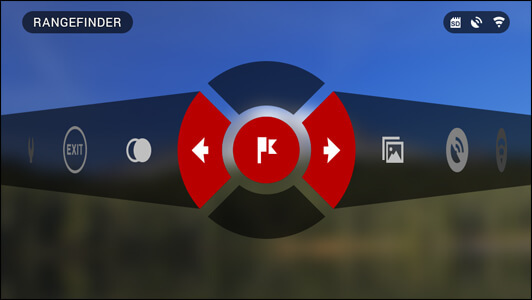 Pressing the CENTER button will take you to the Main Screen of the Rangefinder feature. If satisfied with the value press the LEFT button to go back to the Homescreen or repeat steps 1 and 2 if necessary. COLOR THEME — the color of Night Mode (Green or Black & White). There is NO difference in light gain from Green to B&W. LIGHT SENSITIVITY — can be set to Low, Medium or High. At high your frame rate will be 7.5 per second. You will experience more light gain but at the expense of a lower frame rate. We recommend Medium setting for most uses. 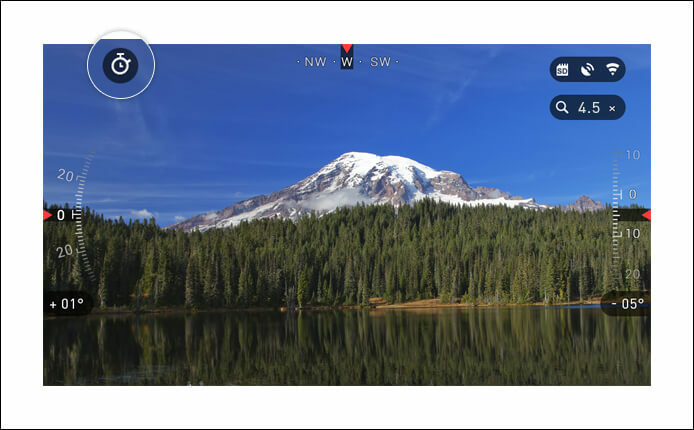 PHOTO MODE — includes Single (capture a single photo), Time Lapse (series of photos at timed intervals) and Burst (up to 10 photos in one second) modes. BURST COUNT — amount of photos in one second (2 – 10). Total Photos — amount of photos in series (2 – 10). Frame Interval — length of the interval (2 – 15 sec). MICROPHONE — sound recording (ON/OFF). VIDEO QUALITY — can be 1080P at 30fps or 720P at 60fps. FORMAT SD CARD — after you choose this subcategory you’ll see a pop-up window asking you about formatting. Remember when formating your microSD card you will loose all information on it, including photos and videos. SCREEN BRIGHTNESS — 1-5 with 1 being the dimmest and 5 the brightest. It is recommended that you use the brightest setting during the day for optimal performance. Sleep mode is activated when your device is not in use for a set period of time (example: 1 – 60min). During sleep mode the display and some of the sensors will be inactive. To get out of Sleep mode and get back to normal operations just physically move the device or press any of the buttons. UNITS — can be Metric or Standard system. Clock Source — allows you to choose different types of sources to improve the accuracy (Manual, WiFi or GPS). Date Format — can be YYYY-MM-DD, MM-DD-YYYY, DD-MM-YYYY. Time Format — form of stating the time (24-hour or 12-hour). Date — enter the date. Time — enter the time. Time Zone — allows you to choose a geographical region with standard time. WiFi — values are not changeable. 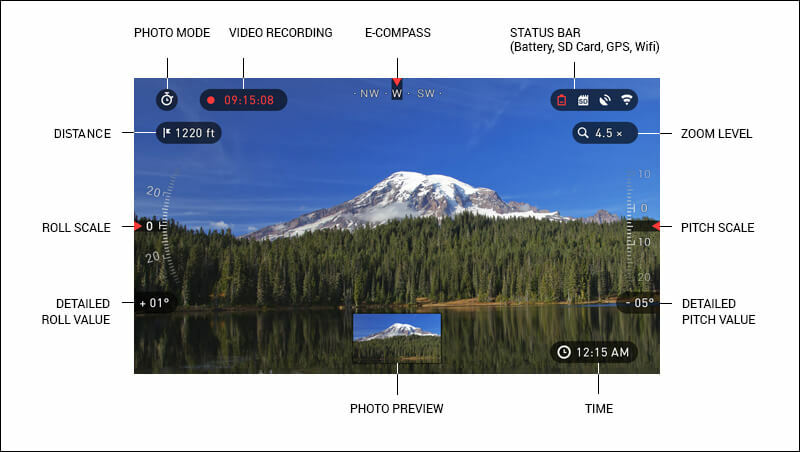 RECORD GEO-TAGGING — adding geographical identification to your videos (ON/OFF). 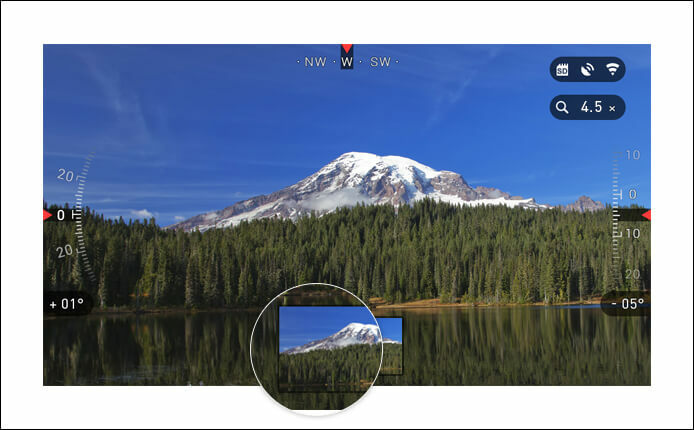 ZOOM — allows you to choose different types of zoom (Standard, Extended). However, we would like to caution you when using Extended Zoom, you will begin to see considerable pixelation at such a zoom. RESTORE FACTORY SETTINGS — allows to reset all the settings to default. 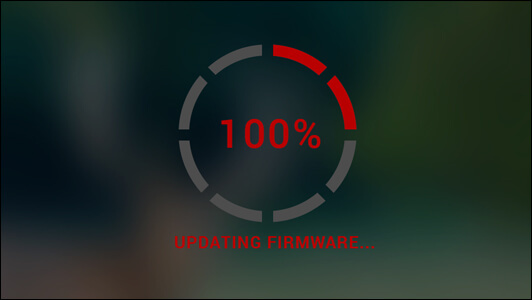 FIRMWARE VERSION — allows you to see the firmware version currently running on your device. We recommend that you register your product on our Update Center (www.atncorp.com) in order to make sure that you are getting emails when new firmware versions become available. We are constantly working on new features, functions, and improvements that we provide to you free of charge via firmware upgrades. Always remember to turn off the device when it is not in use. If you do not plan on using it for a period of more than 10 days, you should remove the batteries. Keep Lens Cap on when not in use. The device is a precision electro-optical instrument and must be handled carefully.